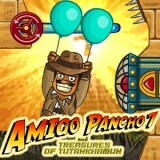 This is your chance to travel with Amigo Pancho and collect all the treasures. Everything depends on you and there is no more time! Cause this guy is already waiting for you. Just imagine that there are a lot of obstacles. Avoid them all and have fun!